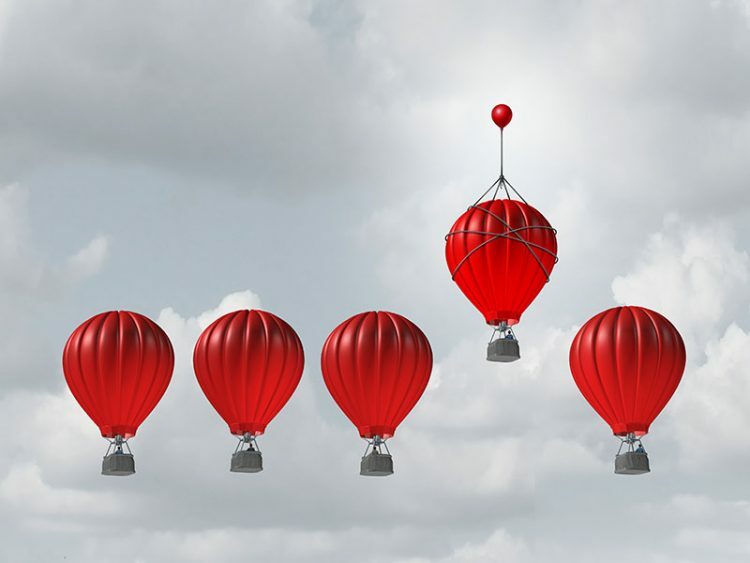 Are you overlooking life insurance as an asset class? Home Sun Life retirement Insurance Are you overlooking life insurance as an asset class? Permanent life insurance – an asset class that can play a number of roles in a client portfolio. Think of the many issues you manage for your clients: building savings for the future, managing investment risk, planning for estate tax issues, ensuring that financial protection is in place should the unexpected occur. Your services cover a lot of ground. What you may be overlooking in covering this ground is a familiar solution that can address two or more of these issues at once. The solution? Permanent life insurance – an asset class that can play a number of roles in a client portfolio. When we think of investment asset classes, we usually think of stocks, bonds and cash investments. But permanent life insurance – such as a whole life or universal life insurance policy that stays in place for a client’s lifetime – not only provides ongoing life insurance protection: it can produce better rates of return than more traditional, conservative purchases like GICs or government bonds. Possible avoidance of estate settlement costs such as probate fees. For clients looking for a tax-effective alternative to a low-risk bond portfolio, permanent insurance is an option worth considering. Universal life (UL) and participating whole life insurance are the two types of permanent insurance most often used as an alternative asset class. 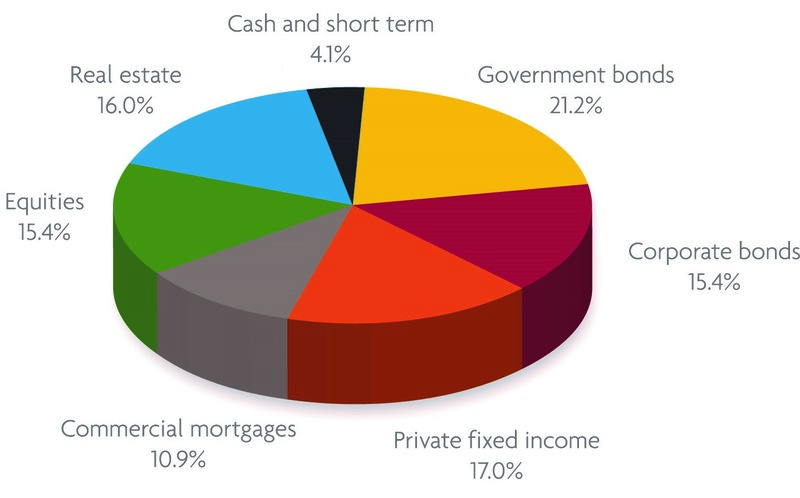 Here are examples of the role that each could play as an alternative asset class. In the case of a minimum-funded UL policy, the death benefit is level for life. The sooner one dies, the greater the internal rate of return, and vice versa. Here’s an example. 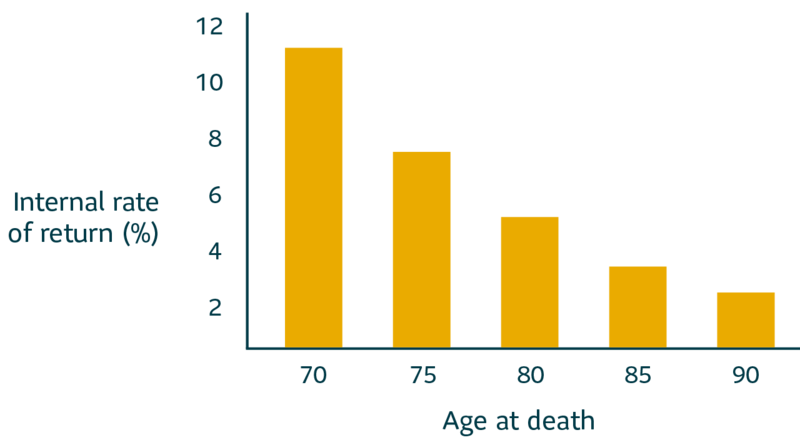 A conceptual after-tax internal rate of return of 3.84% assuming death at age 85 is highly compelling, especially when compared to other low-risk assets. The issue, from an expenditure perspective, is that there is no cash value and therefore no liquidity. And if premium payments stop or the policy is cancelled, your client receives nothing. Of course, universal life can have an investment component as well for clients who wish to pre-fund the policy over and above the cost of insurance. For example, they might contribute $50,000/year for 15 years between the ages of 50 and 65. While this provides a policy cash value (and liquidity), it’s typically lower than the cash value produced by participating whole life policies (as illustrated below). One of the reasons for this is that the lower-risk investment options available in UL policies tend to generate lower returns than those available through a participating whole life policy. Participating whole life policies have less premium flexibility and require higher initial premium payments. But these policies have a significant advantage in terms of the cash value they generate. For example, let’s look again at a non-smoking healthy-risk male aged 50 who is looking for $1 million in insurance. 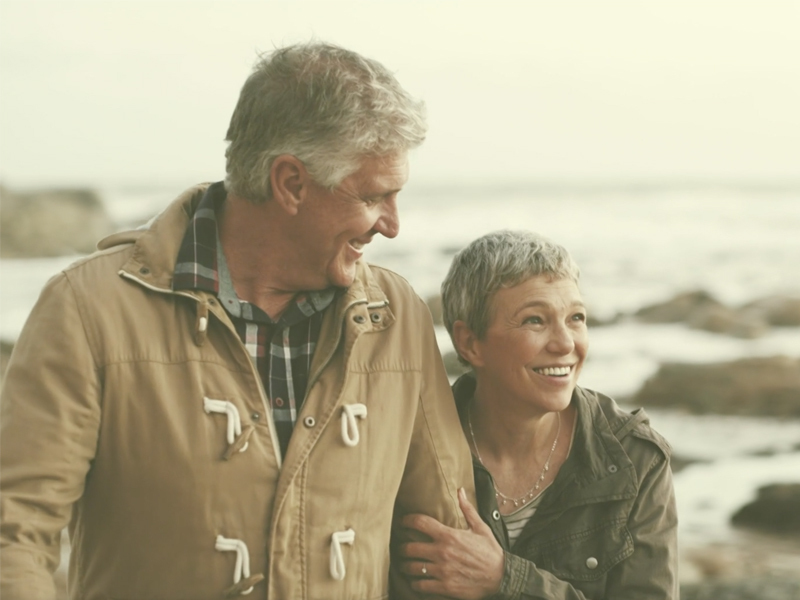 With a participating whole life policy, your client would make annual premium payments of just under $50,000 for 15 years (until age 65), after which premium payments would stop and policy dividends would cover the ongoing insurance costs. Premiums are pooled into a participating (par) account. While part of this money is used to pay for benefits such as policy-owner dividends, death claims, taxes and expenses, the remainder stays in the account and is invested in a diversified mix of assets including bonds, equities, real estate and other holdings. Your client’s share of the earnings in the account are credited to their policy as a dividend payment. Any dividends credited and held within the policy also have an associated cash value. While dividends are not guaranteed, they can accumulate over time, which may result in a policy with increasing values. Par account performance tends to be relatively stable. The chart below shows returns of the Sun Life Par Account and other investments over the past 25 years. *The returns are based on the Sun Life Participating Account (open and closed accounts). The dividend scale interest rate used in determining the investment component of policyholder dividends is based on the smoothed returns on assets backing the participating account liabilities. Government of Canada bonds are nominal yields to maturity taken for Statistics Canada, CANSIM series V122487. S&P/TSX composite index returns include the reinvestment of dividends. 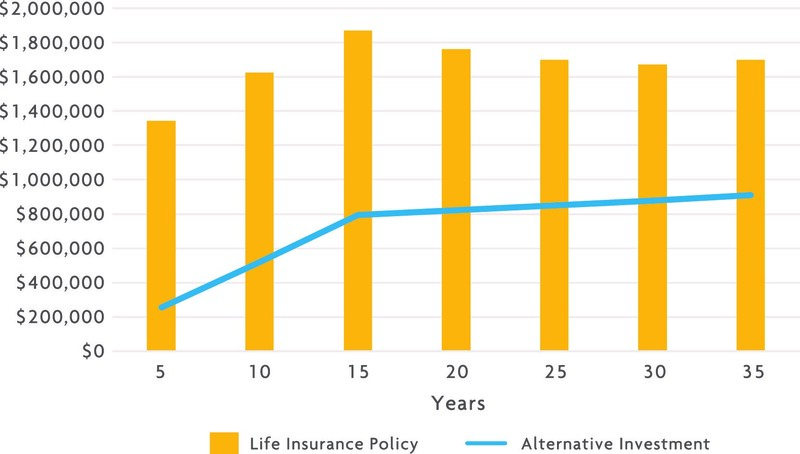 When compared to a UL policy with a similar face amount and funding strategy ($50,000/year for 15 years), the participating whole life policy can yield a similar internal rate of return over time. The key advantage is the larger cash value (as shown below in thousands). The participating whole life policy yields higher cash values at all ages. If liquidity is needed, a tax-effective solution for accessing cash value is to use it as collateral for a third-party loan 1. The proceeds at death can then be used to pay off the loan. The benefit to the estate upon death can be greater for the participating life insurance than for a low-risk non-registered bond portfolio. No investment is “one-size-fits-all”, and permanent life insurance is no exception. It can provide some significant benefits, but the solution has to fit your client’s situation. Are looking to protect their estate and maximize its value. Have a permanent life insurance protection need that complements the need to hold this type of insurance as an asset class. With tax-preferred growth, liquidity, and performance that can exceed that of other lower-risk asset classes, the permanent insurance solution could be a great fit for many of your clients. To learn more, our white paper, Life Insurance as an Asset Class, provides a more in-depth look at the use of permanent insurance as an asset class alternative. **This article is intended to provide general information only. Sun Life Assurance Company of Canada (Sun Life) does not provide legal, accounting or taxation advice to advisors or clients. Before a client acts on any of the information contained in this article, or before you recommend any course of action, make sure that the client seeks advice from a qualified professional, including a thorough examination of his or her specific legal, accounting and tax situation. 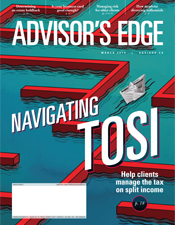 Any examples, illustrations and information based on Sun Life’s understanding and interpretation of the Income Tax Act (Canada) and regulations have been included only to help clarify the information presented in this article, and should not be relied on by you or the client in any transaction. Any tax information provided in this document is based on the provisions of the Income Tax Act (Canada) and the regulations as of March 2019. In addition, these are subject to Sun Life’s current understanding and interpretation of the rules and the administrative practices of the Canada Revenue Agency (CRA) in effect. 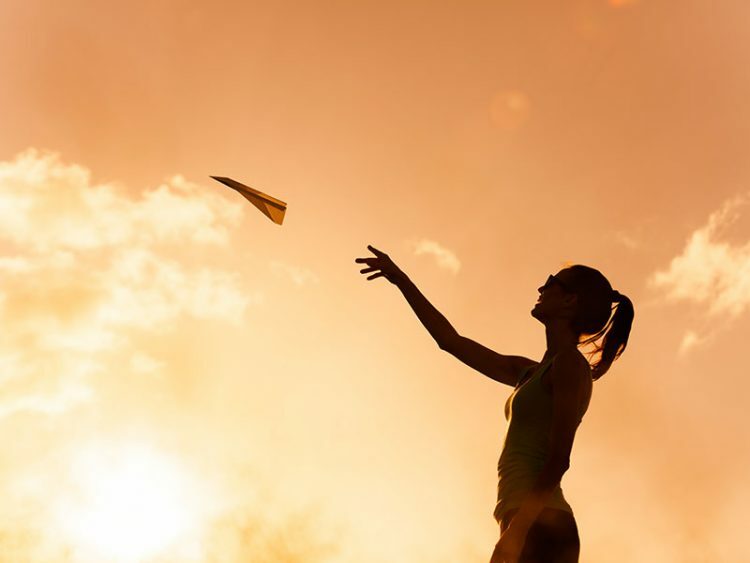 We’ve taken a client-first approach to enhancing Sun Critical Illness Insurance. Now’s a great time to talk to clients about critical illness coverage.